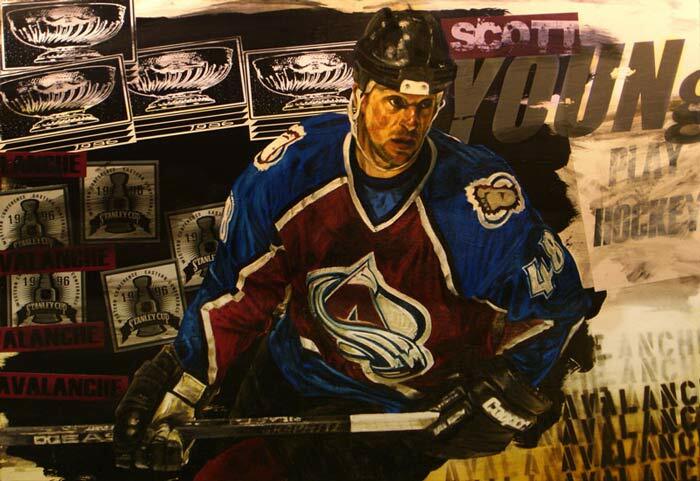 With the 2011-12 Hockey season beginning, we are pleased announce for the third season running, that Stephen Holland will be creating several new works for the Colorado Avalanche as their official artist. To be the number one selling sports artist in the world means you are many things to many people. Name the sport, any sport, and odds are their true fans will know Holland as the artist of the game they love. And the long relationship with Holland and Hockey is a perfect example. Holland has painted the greatest names to ever take to the ice. His numerous collaborations with Gretzky are probably the best known. But beyond this, he's worked with Orr, Crosby, Robitaille, Roy and the list goes on. It's this deep and impressive history with the game, it's icons and of course the fans, that drew the attention of the Colorado Avalanche. In 2009 the two-time Stanley Cup winning team reached out to Holland, in the hopes that he would become their official artist. In the time since then, Stephen has captured in a dozen painted works (so far) their biggest stars. These paintings have been unveiled on the ice, used to commemorate the retirement of numbers, become limited edition prints and posters for the fans, displayed in the arena and the fine art prints are in the players and owners own collections. Now in Holland and the Avalanche's third season together, this tradition will continue, with one exciting work after another.